Redmine is an open source project management tool. It has many features in addition to self-registration for team members, which makes it easier for employees to use. Redmine also has a provision for different application program interfaces, where integrations like Single Sign-On can be added. Implementing Single Sign-On provides ease of access, saves time for login and also reduces cost. Single Sign-On sets up strict controls for employee access along with the need for preventing configuration changes. If the user needs to login using miniOrange credentials there should be appropriate application support for login. Since there is no sync between miniOrange and Redmine, users can't login directly using credentials from miniOrange. miniOrange server has all the features which help the user to login to Redmine. With Single Sign-On if the user is already logged in to miniOrange, he gets automatically logged in to Redmine without any need to enter credentials the second time. Thus, if Single Sign-On is set up for Redmine using miniOrange server it helps the employee to login without any security threat. A) Configure the Redmine application for Single Sign-On. B) In the miniOrange Admin Portal, add the application and configure application settings. First configure the application settings of the Admin Portal and Redmine application and launch the application through the user portal. Before you configure the Redmine web application for SSO, you need the following. 1. An active Redmine account with administrator rights for your organization. 3. Download the certificate from Admin Portal or there is an option to use the organization’s trusted certificate. Setting up the certificates for SSO. To establish a trusted connection between the Redmine application and the miniOrange , you need to have the same signing certificate in both the application and the application settings in Admin Portal. If individual certificate is used upload the signing certificate and its key in a .pfx or .p12 file to the application settings Admin Portal. Also upload the public key certificate in a .cer or .pem file to the web application. Open the Admin Portal, click Apps, then click Add Web Apps. On the Search tab, enter the name of application in the Search field and click the search icon. Next to application icon, click Add. Open the Add Web App screen and click Yes for confirmation. Admin Portal will now add the application. Click Close to exit the Application Catalog. The application that you just added now opens to the Application Settings page. On the User Access page, choose the role(s) that indicate the users and groups that have access to the application. II. Select Automatic Install for applications that you want to appear automatically for users. III. If Optional Install is selected, the application does not automatically appear in the user portal and users have the option to add the application. Step1: Login as a customer from miniOrange Admin Console. Configure the apps. 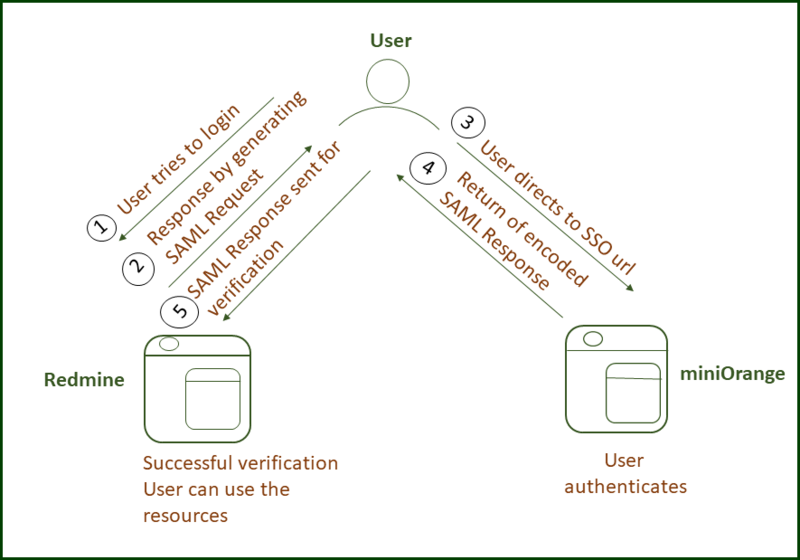 Step2: Click on SAML Tab. Select Redmine app and add the app. Step3: Set the SP Entity ID, ACS URL, Single Logout URL and Save. Step4: Click "save" to configure Redmine. Step5: Click on download certificate and save it, it will be required later. Step6: Create policy for Redmine. Step7: Create new policy, by selecting group name from dropdown where you want to add Redmine policy. Step8: Onboard users into our system. Step9: Register users into our system (End Users). Step10: Setup Single Sign-On for your domain (miniorange) in Redmine. From the left menu, go to Apps > Manage Apps. In the search apps textbox, type Redmine. Select Redmine and click on Add App. Custom Application Name App name you like to provide. Here it is Redmine. From the left menu, go to Policies > App Authentication Policy. Click on App Policy tab. From the Application dropdown, select the Custom Application Name you would like to provide before. Enter Policy Name you would like to provide. Eg. Redmine Policy.